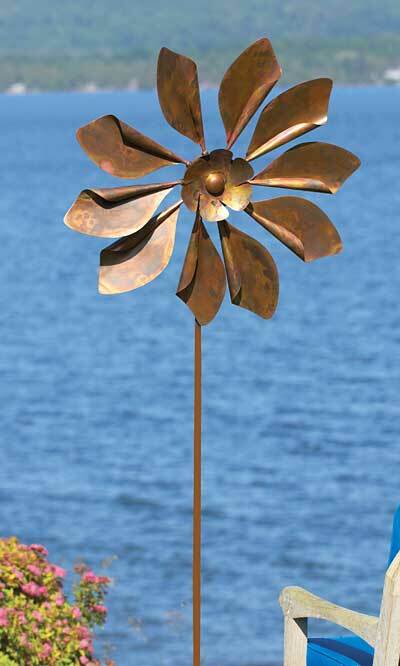 Place a significant and familiar bloom in your garden using the Ancient Graffiti Kinetic Giant Daisy Spinner. The spinning topper, copper color, and generous size of this unit form a striking accent, and its familiar shape lends a cheerful look to your garden with ease. The ten petals on the 30.5" diameter topper grab attention, and the iridescent sections throughout the copper colored finish reflect sunlight for added style. A smaller, daisy-shaped accent rests in the center of these petals, bringing depth to the piece while camouflaging the bearings. These bearings, along with the significant size and shape of each petal, allow the top adornment to spin in a breeze for exciting movement. This topper attaches to the included, 78" tall stake, for striking height and drama in your yard. The four-pronged base keeps the accent stable in your soil, and the pointed end of each leg makes installation simple. Made from lasting iron, the spinner withstands exposure to the elements, and will weather over time for a changing and dynamic finish. Enjoy a daisy theme in your garden throughout the year with this Kinetic Giant Daisy Spinner. Assembly required.